Baby Songs is a free App that can be very useful when you want to put baby to sleep or for a nap. Baby Songs features default songs and soothing lullabie. The app comes with a great collection of english, japanese, french lullabies ; melodies and white noises. You can also customize the content and record your won lullabies or melodies. The app works also on « auto mode », if this feature is activated the user can set up a noise level that when reached triggers the app to play one lullaby. 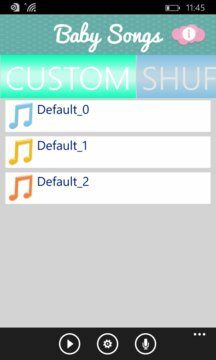 The app then can work on it’s own : the application detects the ambient sounds and automatically plays the selected song. 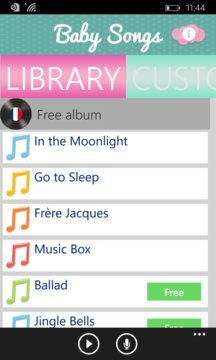 On the library tab you can select the lullaby or the molody you want to play. ➢record your voice singing your favourite lullaby. Once the lullabies and melodies are uploaded on your device you can activate the flight mode to prevent your phone from ringing and emitting waves. It is not recommended to leave your phone in your baby’s bed. It's best to place the phone on a table nearby to keep it at a safe distance from your infant.